Azure Managed Applications enable Managed Service Provider (MSP) and Independent Software Vendor (ISV) partners, and enterprise IT teams to deliver fully managed, turnkey cloud solutions that can be made available through the Azure Marketplace or through the enterprise service catalog of a specific end-customer. In this blog, we’re focusing on the Azure Marketplace scenario. You can find more about the  Managed Application service catalog here. Customers can quickly deploy managed applications in their own subscription and rely on the partner for maintenance operations and support across the lifecycle. Azure Managed Applications is an additional partner opportunity to expand beyond infrastructure and software, by attaching services and operational support to Azure solutions. 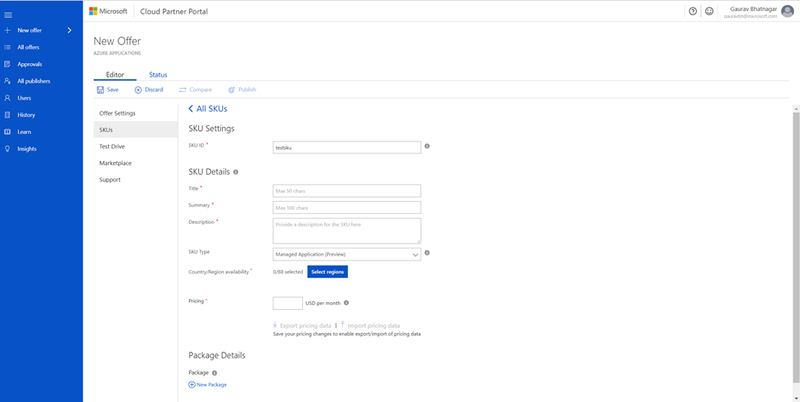 Partners using Managed Applications can invoice customers directly using Azure’s billing system (when publishing at Azure Marketplace) and use Azure Resource Manager templates to support the lifecycle of deployed applications. All of this enables an even richer cloud ecosystem for our customers and new busines opportunities for our partners. Partners publish their Managed Applications to Azure Marketplace using the Cloud Partner Portal. The main components required are a) the template files, which describe the resources that will be provisioned, and b) the UI definition file, which describes how the required inputs for provisioning these resources will be displayed in the portal. The required files are packaged in a .zip file and uploaded through the publishing portal. Below is the screenshot from the publishing portal, and more detailed instructions can be found here. There are no additional fees for partners publishing Managed Applications into Azure Marketplace or customer Service Catalog. Partner need a Microsoft Dev Center account before they can publish. Publishers of managed applications can associate a flat monthly cost with the solution they’re providing in marketplace. This is additional cost will show up as a separate line item on customer’s Azure invoice. Existing Azure Marketplace partner revenue models will apply. The resource group containing the resources which are part of the Managed Application is “locked” for the customer. The customer has read-only access to the resources in this resource group. As a result, the customer cannot accidently delete or update the resources which are part of the Managed application. The publisher of the managed application, however, gets either the required permissions which enables him to maintain, service and upgrade the application in the customer’s tenant. These permissions are defined by the typical Azure RBAC roles. More details on this can be found in the Additional Resources section. Managed Applications service is available in all globally available Azure regions. Xcalar Data Platform is an open and extensible analytics platform that delivers actionable insights with simplicity, speed, and scale. Its patented technologies provide a cloud-scale platform for the complete analytics pipeline including data preparation, data science, data warehousing, and ad-hoc analytics. Xcalar’s enterprise grade software scales to hundreds of nodes, thousands of users, and petabytes of data, for both on-cloud and on-premises deployments. Cisco Meraki simplifies the life of the IT administrator by reducing the effort required to perform everyday tasks on the network. Auto VPN and SD-WAN enable administrators to create and optimize site-to-site VPNs with just a few clicks, and now this capability can be extended directly into the Azure cloud, so that IT resources become remotely accessible through a robust, optimized network in seconds. Cisco Meraki customers have the ability to create a virtual appliance in Azure, which can then be managed through the regular Meraki dashboard for easy remote access to IT resources. Below is a short summary to help in understanding the differences and key capabilities when publishing to Service Catalog or Markeplace. No fees to publish for partners. Microsoft Dev Center account required. Access innovation from thousands of partner in Azure Marketplace with ease. Monetize lifecycle management services. Monetize the custom solution and support services provided. Offer applications to all Azure customers via Azure marketplace. Direct customer contact and understanding of usage patterns with ability to drive innovation in product. Use Azure billing system to bill end-customers, offloading operational work.